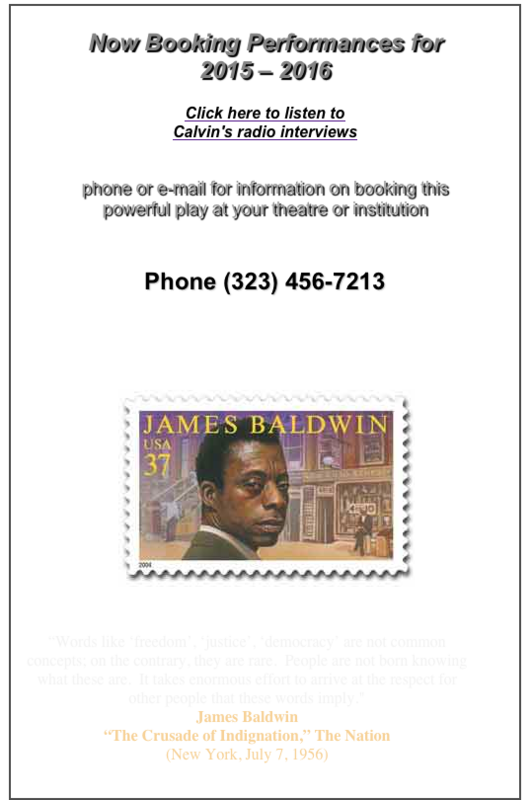 "Calvin Levels is marvelous in his role as James Baldwin in this powerful play. Please do not miss it!" "A great actor channels a great writer in a national tour, with readings, anecdotes, and contemporary political commentary." "...I stopped being aware of you (Levels) in a role. It was Baldwin that I was seeing and hearing up there." 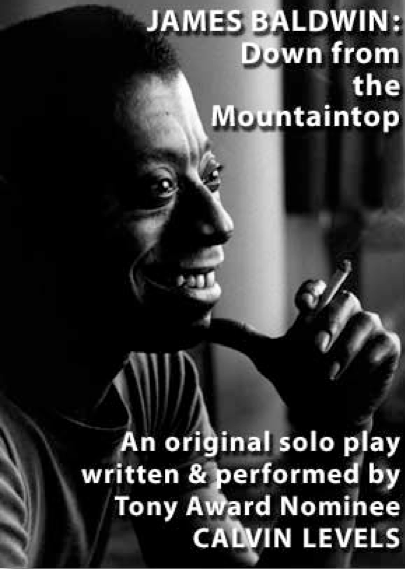 "Levels…has a hypnotic power that creates a revival fervor…"
"Calvin Levels does an amazing job of conveying the complexity of James Baldwin in his one-man play, James Baldwin: Down From the Mountaintop. Students were inspired to read his works, everyone was moved by the power of the performance and inspired to keep Baldwin's spirit alive." "I thought Calvin's performance was compelling -- we enjoyed it immensely. Baldwin's life and work offers so much material for a playwright -- the scope and balance seemed good to me and that's, of course, not easy because Baldwin was such a complex person." author "James Baldwin's Later Fiction: Witness to the Journey"
"...Calvin masterfully guided us back through the life and time of Baldwin with keen historical insight and a brilliant, sensitive interpretation of Baldwin's personal struggles with race, sexual orientation, spirituality, and the politics of a writer's life in pursuit of equality and justice..."
"...Levels insightfully brings to light his subject’s rare and admirable qualities."